I'm working on implementing a workflow which will start automatically on change/creation (which is working). The issue is that there are a few folders which need cross-department approval. Is there a way for a workflow to check which folder in the document library the file is in before assigning Approval tasks? Ex) In the below structure, I would need File A to be approved by Ann, Bob, and Chris. Meanwhile, File B would need to be approved by Dan, Eric, and Fred. 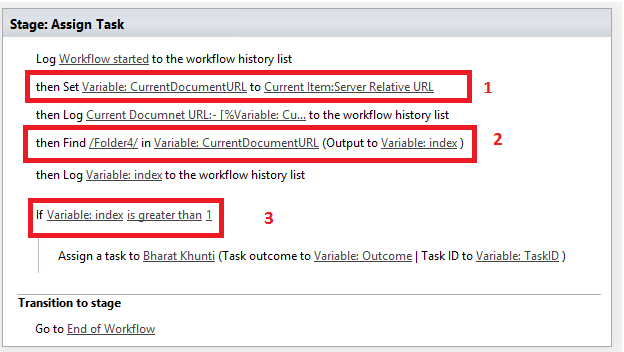 You can check if current item relative URL is contain Folder name then assign task to related user. To check current document inside Folder(e.g. Folder4) or not. please follow below step that mention on screenshot. Note: - Makes sure that folder name and List name or Folder name and Site name are not same. Not the answer you're looking for? Browse other questions tagged workflow designer-workflow folder approval-process approval or ask your own question. Auto cancel existing workflow on change of document?